Day one: Budapest: ‘My house in Budapest, my hidden treasure chest, Golden grand piano, My beautiful Castillo,’ George Ezra. Always looked forward to seeing more of Europe. Anyone who knows me, knows my life revolves mainly around Italy and Spain. I look forward to branch out and independently see more of this world. Set off on a 25 day trip and will visit Hungary, Austria, Croatia, Slovenia and back to my beloved Italy. It’s a big hike. Let’s not get into that just now. Let’s complete day one’s blog. Met a lovely couple on the plane who offered to share a taxi with me from the airport into the inner city of Budapest. Really friendly and highly entertaining; the three of us were trying to translate different Hungarian words. This is not a Latin language (I must repeat this ten times to myself to ensure I don’t push myself too much regarding trying the basics). One of the words was the word for baggage reclaim, poggyászkiadóba. Podgy Peggy at poggy? You’d think there had been no polyglot amongst us. 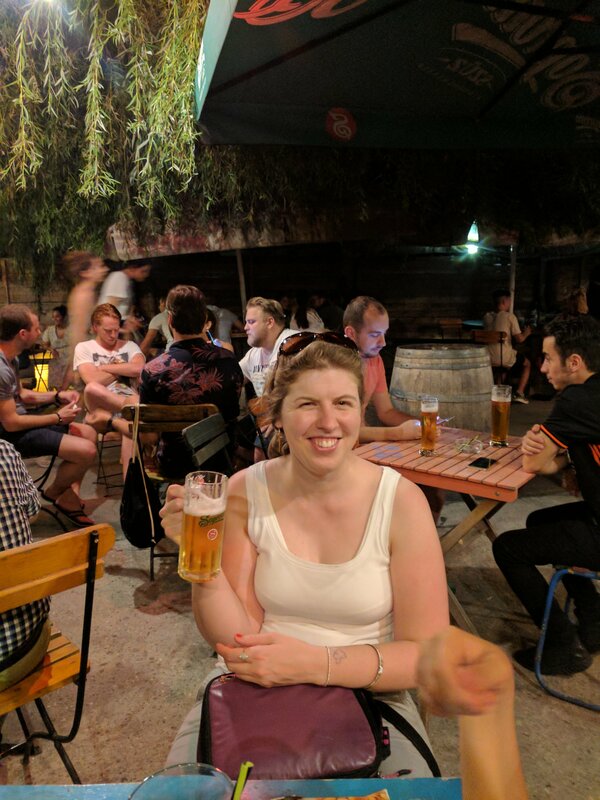 Met up with Ang and Julia in the hostel and had a beer in a cool beer garden… Like £1 for 30cl of beer! Whhhhhat? Regarding holiday reading, the book I chose to bring along for the journey is, The power of now by Eckhart Tolle. It’s time to give myself some perspective, goddamit ;)… On a serious note, it will hopefully instill some patience to allow things to develop in life, to develop day by day and not guess the fate that’s ahead of me. Anyway, back to the now. If I am actually practicing what E.Tolle preaches. Currently 6.45am in Budapest, laid in inner city hostel and in a shared dorm with 9 other travellers, two my friends: Angi and Julia. Those girls are great. I can smell the air, fresher than last night. I can hear two Spanish guys from La Coruña roncando (snoring). Time to shake myself and get dressed and discover day 2 of this amazing city with such a lively feel. In desperation of a coffee, even better if Hungarian. Bye for now. I look forward to reading more about your trip. I’ve nevr been to Hungary, while I did visit some bits of Croatia, Slovenia and Austria. Aaah, Hungarian is one of the two non-Indo-European languages in Europe, makes sense it’s so weird. I remember the price of alcohol shocked me in Prague too, it was cheaper than water! Ps: this is Elisa, btw. Hi Elisa, thanks for commenting! It was great the trip, didn’t complete for a couple of reasons. Will hopefully get to in a few years time. Yes! I made that exact comparison; beer is cheaper than water!